Shoulder trauma is vast and encompasses a significantly large scope. The number of structures that can be injured in the shoulder is significant, so not all shoulder traumatic injuries will be discussed here. In general, shoulder trauma is either bony or soft tissue. In trauma, it is important to have a tailor made approach when determining the best approach to fixing the injury. The results of shoulder injuries is not as good as that of other regions in the body such as the hip. However, with specialised techniques, using traditional values with new technology, more superior results can be seen. Fractures around the shoulder can be straight forward or highly complex. A simple clavicle fracture, from a bony perspective is an easy bone to fix, however the complications that can occur due to surrounding structures makes it one of the most complicated procedures to perform. The vein and artery of the shoulder as well as the lung and the nerves of the brachial plexus all lie in very close proximity to a clavicle fracture. There are reported episodes of serious complications, and worse. Sometimes bone can injury the structures around the clavicle causing damage that is only determined at the time of surgery. 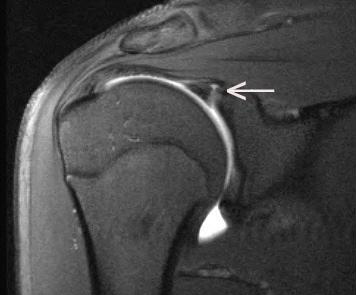 Fractures involving the ball and socket part of the shoulder rarely results in 100% recovery. The shoulder joint is highly complex, and relies much more on muscle tensions and soft tissue integrity than, say another ball and socket joint, the hip joint. The ball and socket joint of the shoulder is unique in that the bony socket side is very shallow, and therefore allows a huge range of movement of the shoulder in comparison to a more restrained joint such as the hip. The stability of the shoulder comes from the soft tissue around the shoulder, including the labrum, and rotator cuff muscles, as well as the tough, capsular structure that envelopes the entire shoulder joint. Fracture fixation requires a specific approach to maintain these structures and repair them in such a way that should maintains its stability. Soft tissue injuries of the shoulder can result in rotator cuff tears, SLAP and other labral tears, biceps tendon tears and muscle injuries. These are often harder to treat, as there is less blood supply in these soft tissue structures meaning that healing time takes a significantly longer time. An MRI is often performed to determine the exact nature of the soft tissue injury for planning prior to surgery. Depending on the type of surgery you will require, your stay in hospital can be 1 night to 1 week. Your rehabilitation time is generally about 3 months after your injury, to get you back to a high functional state. Sometimes it can be longer, depending on what was injured. A serious but self limited consequence of shoulder trauma is a condition called Adhesive Capsulitis. It is also sometimes called Frozen Shoulder. It is not fully understood why it sometimes occurs, but trauma to the shoulder, immobilisation, as well as multiple procedures seems to play a role. It is a self limiting condition in that the majority of cases resolve within 18 months. In some cases, the shoulder requires a manipulation under anaesthetic to aid in its recovery, but this can also cause more scarring which can be counter productive. Multiple treatments have been suggested in the past, however most have failed, with literature finding that often the best course of action is to observe and wait for it to resolve. Shoulder trauma is a complex interplay between the bony and soft tissue structures. It is imperative that a sound knowledge of the muscle forces and soft tissue stabilising structures are known, prior to embarking on any surgery. For more information, please contact the rooms of Dr Chien-Wen Liew on (08) 7099 0188.